A 1st MTPJ arthrodesis (or fusion) is a common procedure undertaken to correct a number of different 1st MTPJ (big toe) deformities. The surgery is generally indicated if the joint is extremely arthritic or the bone quality is too poor to perform another surgery. The joint/bones are generally reduced in size and are fixed in a better position. 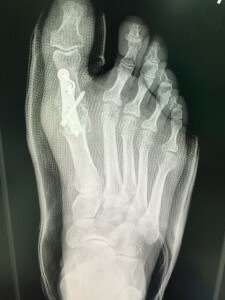 The surgeon uses a number of screws and a specially designed plate to fuse the person’s big toe permanently. This should reduce the patient’s symptoms and preserves overall foot function as best as possible. The 1st MTPJ arthrodesis is an extremely successful surgery with a documented 95% success rate. 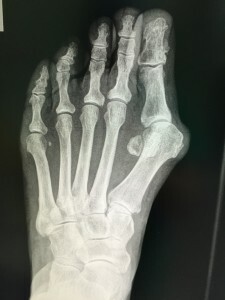 There is a small risk of non-fusion and some patients can develop IP joint pain (small joint in your big toe), tarsometatarsal pain (where the long bones meet the smaller ones in your midfoot) but any underlying degenerative changes/arthritis in these joints will be assessed on imaging before surgery. Similar to the Scarf and AKIN procedure a 1st MTPJ arthrodesis is commonly used to treat HAV (bunion) patients and is often done in conjunction with lesser toe surgery. Patients are generally put into a light but bulky dressing for the first ten days and then will be changed into a small weight bearing cast and wound shoe for the next four weeks. Patients can generally return to normal activity at six weeks but it can often be three months before you return to full activity.